Bangkok-based Hospitality Management and Development Asia (HMD Asia) will open their first managed property, Treeline Urban Resort in Siem Reap, Cambodia, on November 1 this year. Owned by managing director Sokoun Chanpreda, HMD Asia is a globally recognised developer, known for their creative and successful operation of independent boutique hotels such as Shinta Mani Hotels, restaurants and bars in Southeast Asia. They offer a full range of services including concept development, technical design, financial assessment, training and management. Treeline Urban Resort is a newly built boutique design property, located on the banks of the bustling Siem Reap riverfront. The property will have 48 keys comprising 36 rooms and 12 suites, together with modern culinary outlets including a trendy rooftop pool and bar. Conceived, designed and owned by Hok Kang, a young pioneering Cambodian designer, the resort’s name is inspired by the majestic Angkorian trees that line pathways and are scattered across the last vestige of the Angkor Empire. Treeline Urban Resort will add an innovative urban style to the local hotel scene. 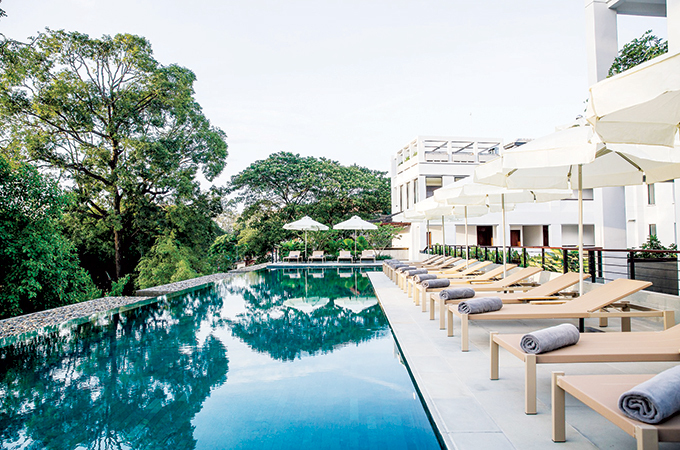 Hok Kang’s clear vision for the property was to create a unique style of hotel in Siem Reap that both inspired and excited the modern millennial traveller. The resort will blend the traditional elements of design with contemporary sophistication which is intimate yet inviting and vibrant yet tranquil. With its location in the heart of Siem Reap’s historic quarter, the resort will be perfectly located to take full advantage of the city’s growing art, food and cultural scene. An arts lounge and bar, rooftop pool overlooking the river, restaurant and spa will set the scene for discovery. Guests will be able to take in the vibrancy of the river walk within the crafted food and beverage outlets and retire to a sanctuary of privacy, comfort and tranquillity within the leafy courtyard and resort grounds. In keeping with their commitment to help and promote local artistic talent within the community, the resort will set up the Treeline Art Foundation. Showing further support to local artists, the Resort appointed a local Cambodian Designer, Sokna, to design and produce the uniforms for the staff.